The New York State Legislature passed a series of historic reforms Monday that will allow victims of child sexual abuse to seek justice through the court system once they become adults. 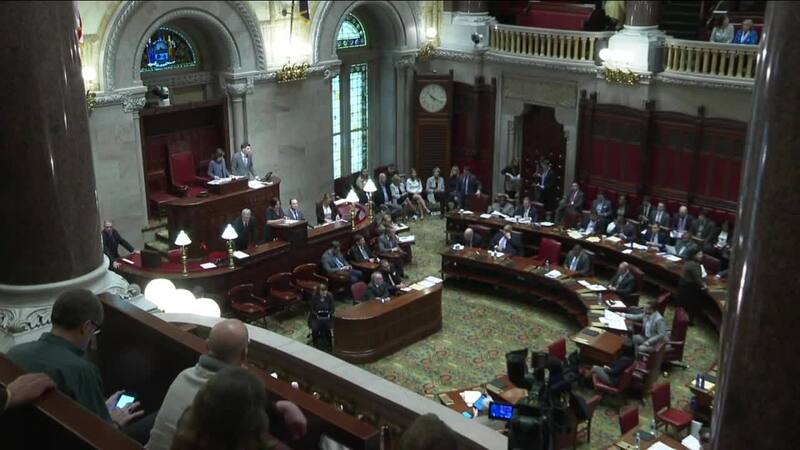 ALBANY, N.Y. (WKBW) — The New York State Legislature passed a series of historic reforms Monday that will allow victims of child sexual abuse to seek justice through the court system once they become adults. Both the Senate and Assembly passed the long-awaited Child Victims Act as victims of priests from the Diocese of Buffalo and other institutions looked on. It was the testimony of those victims, the scandals that have erupted again in the Catholic Church and the transfer of political power in Albany that finally broke through the logjam. New York’s sexual abuse laws -- considered archaic by many when compared to other states -- previously barred criminal or civil charges from being filed after the victim’s 23rd birthday. Many sexual abuse victims do not fully realize the effects of the abuse or make it public until they are around 50 years old, victims say. That meant that even in cases where sexual predators admitted the abuse -- like the Rev. Norbert Orsolits did in March -- they could not be charged criminally and the victims could not take institutions like the Catholic Church or others to court for covering up the abuse. But now -- after Gov. Andrew M. Cuomo signs the bill into law this week -- victims of child sexual abuse will have until age 55 to file civil charges against the perpetrators or the institutions that were responsible. The law would apply to private schools or organizations like churches and also to public schools. Criminally, the statutes will be raised from 23 to 28. The law also puts into place a one-year “look-back window” which would suspend all statutes of limitation in civil cases for one year, allowing throngs of victims who were abused while the old law was in effect to come forward and file civil lawsuits today. The Catholic Church had strongly opposed that measure and New York’s bishops spent nearly $2 million lobbying against the Child Victims Act before rescinding its opposition last week. For the one-year “window” period, victims of any age -- even over 55 -- would be legally allowed to take their claims to court, attorneys and officials in Albany said. City & State magazine in Albany wrote that the reporting of 7 Eyewitness News and other media was critical in getting upstate lawmakers to support the Child Victims Act. State Sen. Tim Kennedy, D-Buffalo, was an early advocate for the reforms, which were held up last year by Senate Republicans, and Kennedy invited Whalen to sit in Senate chambers to watch the historic vote. "We pray that the passage of the Child Victims Act brings some measure of healing to all survivors by offering them a path of recourse and reconciliation. The legislation now recognizes that child sexual abuse is an evil not just limited to one institution, but a tragic societal ill that must be addressed in every place where it exists." Many other states have reformed their laws in recent years as the true effects of child sexual abuse have come into the spotlight. Many victims say their lives are “never the same” after the traumatic event, and they hide the abuse for decades before realizing later in life that making it public can be a source of healing and also a way to hold the institutions accountable and prevent future abuse. Bankruptcy has ensued for Catholic dioceses in other states after abuse laws were reformed, but Buffalo Diocese lawyers have said it is unlikely because its insurance coverage will kick in after the law is passed. In addition, 7 Eyewitness News earlier this year obtained internal records that show the diocese had a surplus of $48 million as recently as this summer. One Buffalo lawyer said he was on the phone all weekend with victims who have said they are interested in taking their claims to court. Some believe the Buffalo Diocese increased the likelihood of getting sued when it decided to deny compensation to any victims who came forward after March 1, as reported this weekend by The Buffalo News . Documents obtained by the I-Team show that could impact dozens of victims who reported the abuse this year at the urging of the diocese, believing they might receive compensation. "I was silly enough to trust [that] the process might be helpful," one victim told 7 Eyewitness News about the diocesan settlement program. "It's made me and my friends and family so angry that pursuing a lawsuit is now more personal than it ever would have been."